Football trials in India, Bangalore. Do you want to become a professional football player in India? The term professional footballer means being able to have a sustainable career and leading a comfortable life by playing football. Answer these questions honestly before you scroll down further. Does any football club in India provide for a development path for you which will help you lead a comfortable life? The truth is even if you play ISL or I league , the chances for a long term sustainable career is very bleak as there are only about a 1000 players in India who can call themselves professional. Without having professional approach in training, do not expect to become a professional footballer in India. Where will you find a set up which will provide for professional football development and training in India? What is the point of joining a football academy if you do not graduate to play higher levels of football in India? 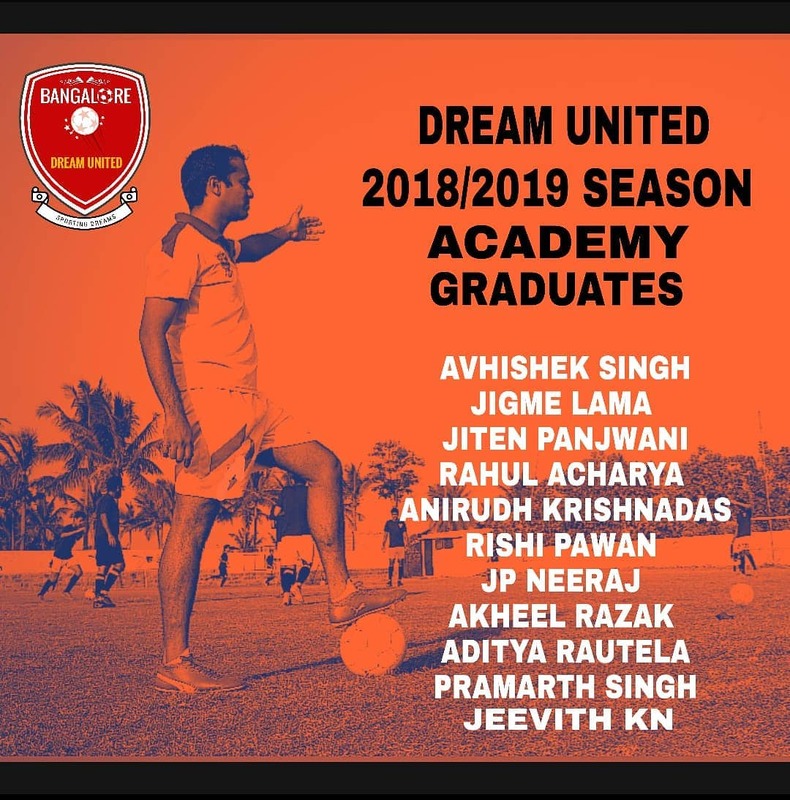 We at Dream United, pride ourselves in doing the right things to develop young footballers. We have just scratched the surface with a conservative approach in the 2018 season. We take players through a systematic program analyzing their bio-mechanics with the help our Human Movement Science specialist Badrinath Rao which enables skill development in players at a tremendous rate by decoding their first touch element and explosive movements. World class processes to produce world class players. That is our motto. Here is the proof of football development in India. "It was heartening to see five of our academy players play in the starting Xl. We had a red card and an injury, and three of them had to play in three different positions. That is THE win for me." - Sharath Kamath. Our manager finds joy in the fact that the academy boys have produced strong performances in the opening matches of Super division. Learning never stops. For over two years our academy players have overcome several challenges and defeats. Our true victory is in the learning we take away from these defeats. Furthermore our competence is reflected on the pitch along with the lessons learnt as an outcome of our past experiences. A good result is not necessarily a scoreline in your favor. 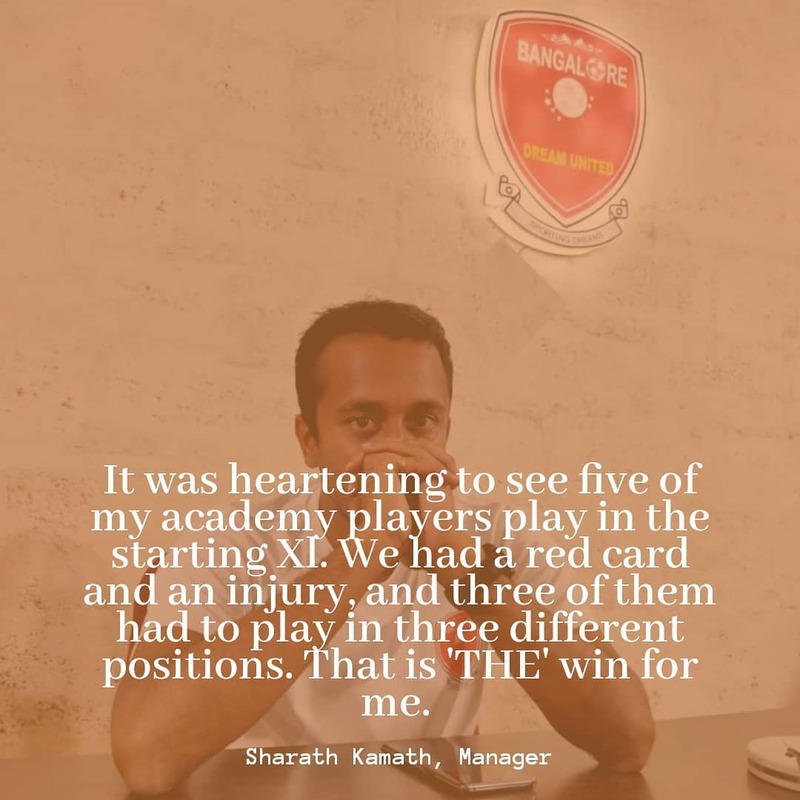 We see our young boys who started kicking the ball two years ago and are now turning in good performances against established professionals on the biggest footballing stage in Bangalore. Most football clubs in India find it difficult to call themselves because of the quality of the football they play and their inability to draw a crowd to watch them play which leads to lack of viewership and no interest from sponsors. Our brand of playing the beautiful game is one that is loved by many football fans in Bangalore. Our philosophy is to graduate young players to play in the senior team. The average age of our senior team is 19. Please click here to register for football trials at Dream United Football Academy. We are always on the look out for talented players. Please fill this form with all your details. We will be calling for trials periodically. Please click here to fill the form.